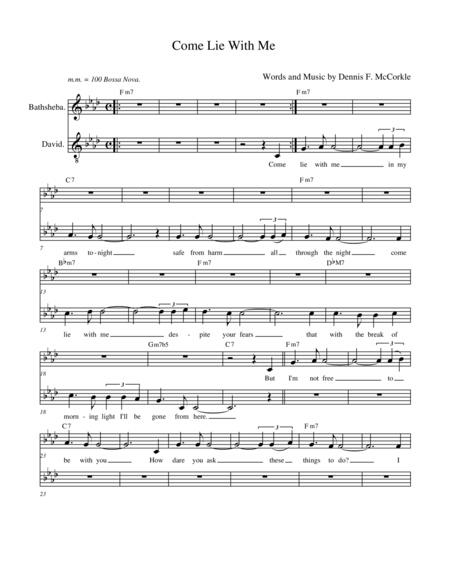 Composed by McCorkle, Dennis F. . Contemporary Christian, Jewish, Broadway, Musicals, Rock. Lead Sheet. 25 pages. 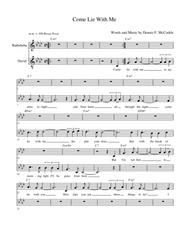 Published by DF McCorkle Music and eBook Publications (S0.39647). ACT TWO: Song 5. "The King," by Dennis McCorkle, is a contemporary pop-rock musical of the first two kings of Israel, Saul ben Kish and David ben Jesse and explores the contrasting lives and outcome of each man’s choices in life. [2 Samuel 11:2-4… - “And it came to pass at eventide, that David arose from off his bed, and walked upon the roof of the king's house; and from the roof he saw a woman bathing; and the woman was very beautiful to look upon. 3 And David sent and inquired after the woman. And one said: ‘Is not this Bath-sheba, the daughter of Eliam, the wife of Uriah the Hittite?’ 4 And David sent messengers, and took her; and she came in unto him, and he lay with her;…”] Once settled into Jerusalem and after a tiff with MICHAL, DAVID looks around his magnificent palace and as he walks on his balcony, he sees a lovely young woman bathing herself in the moonlight. Giving in to his impulses, orders his men to have her brought to the palace on the pretense of speaking to her about her husband, URIAH who is in the field with the troops. DAVID, seeing her beauty and rationalizing his own importance, proceeds to seduce her and lies with her [“Come Lie with Me” – David and Bathsheba]. BATHSHEBA, also lonely is seduced by his presence and gives in to his wishes. Leaving before daylight to escape notice, DAVID goes about business as usual, trying to forget what has happened. A few weeks later, a messenger arrives with a note from BATHSHEBA, “DAVID, I'm pregnant!” Also included with your order is our new 20 page catalog of over 150 titles at no additional charge.